The Eaton County Clerk, which can be emailed at CircuitCourtClerk@eatoncounty.org, provides all the vital records for the county. Marriage records are available from 1838 to the present, divorce records from 1847 to the present, and birth and death records are both listed from 1867 to the present. Office space requirements restrict more than four genealogy researchers at one time, and the office charges $12 per certified copy, and $5 for extras. The Clerk's office is on 1045 Independence Blvd., in Charlotte, MI. Detailed instructions on how to get specific records are included on the County Clerk website. The county also recommends use of the VitalChek service to order physical copies of records if a trip to the office is not possible. 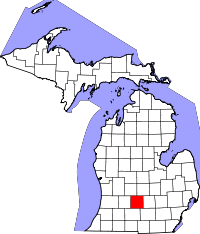 Eaton County is one of several in Michigan known as "cabinet counties" due to be renamed after members of President Andrew Jackson's cabinet in the early 1800s.